For your next trip to Mexico you might want to consider Travel Health Insurance, although I never have. As I get older I may consider it, but for now I’m in pretty good health and a bit of a risk-taker (my wife would define that as stupid). A good, legitimate insurance policy can be purchased for a reasonable price and may include evacuation services in case of an emergency situation (no, a severe hangover will not qualify). For further information you can check in your favorite search engine and you will find 10 or 15 companies where you can comparison shop for rates and benefits. Some foreigners who live in Mexico on a small budget buy into the government program IMSS, or Instituto Mexcicano del Seguro Social. I have found a very helpful and informative web page that gives you a complete description on how it operates and why it makes sense for many expats:http://www.mazinfo.com/infofiles/IMSS.htm. As you will see, a person between 40 – 59 years old can purchase a policy for about $175.00 per year and over 60 for about $250 per year. You probably wouldn’t want to use it for something major, but if it is all you can afford it does offer you a chance to save your life. Many expats enroll in IMSS and then use local, private doctors when the situation calls for it. Private doctor’s fees and services are a fraction of the cost as is in the U.S., with a typical doctor’s visit running around $20.00 US. I have heard a few accounts where the care wasn’t so good, but for the most part a local doctor in a tourist area or a large city will take care of your problem in a competent and friendly manner. It was the dawn of a new era for Mexico in December of 2006. After a fierce and public battle with Andres Manuel Lopez Obrador, Felipe Calderon took office with the daunting task of walking the walk and talking the talk of his campaign. Though it’s only the first of his six year term, in my opinion, he has weathered the storm of doubt (so far) and is on his way to perhaps changing the face of Mexican politics. I say that with hope, and with reserve, as I think most of us who follow politics south of the border always know it can go sideways very quickly. When I first began working in Mexico, Ernest Zedillo was President. I was just learning the ropes and starting to grasp the magnitude of the social and political problems that always seem to hang over the country like a cloud of cement. (I actually had the honor of briefly meeting Mr. Zedillo, which is always a very cool story for a blonde gal from Arizona!) Anyway, by the time Vicente Fox took office in 2000 as the first opposition candidate to win in 70 years, the country was ready for big change and looked to their new President for the answers. The people stood united and hopeful….waiting, waiting, and waiting for things to turn around. Unfortunately, Fox turned out to be a lame duck (still quacking loudly) who made a terrible mess of things then turned it all over to Calderon. That said, Calderon has hit it head on, and so far, seems to be on the right track. He has taken unprecedented steps against the drug lords (which has been met with plenty of controversy), has managed some significant legislation, and has displayed some very impressive leadership… epecially with the flood disaster in Tabasco. He has had to face the teacher’s strike in Oaxaca that led to anarchy and street battles, not to mention the vicious drug wars that continue to escalate around the country. Yet, he continues on his steady pace swimming through the quicksand of politics in Mexico. I like him. I wasn’t sure I would, but I do…. for now. I liked Fox at the beginning too, but for some reason, I have more trust in Calderon. Seems the people are pleased as well. Calderon has enjoyed an average 60% approval rating throughout 2007 despite the fact that he was elected with just more than a third of the vote. He’s more savvy than Fox, who wasn’t able to ever stop the breakdown of Mexico’s multi-party Congress. Calderon, a member of the National Action Party (PAN) just like Fox, has played smart and reached out to the opposition and has accomplished more structural reform in one year than his predecessor did in six. Now I’m just an American sitting in the observation room, but I think Calderon’s Mexico has made significant progress in 2007. It’s time for this country to finally get it right and take steps in a discernable forward direction. There’s a lot of time left, and a long road ahead, but my pesos are on Felipe to make it work. Stay tuned! The last days of 2007 saw long lines at Post Office passport application windows, with many people falsely believing that application fees were increasing on January 1, and that the requirement for border crossing was changing on that day. Although the fees will increase, no date has been set yet. The present rules are that anyone traveling by air between the U.S. and Mexico has been required to present a passport or other valid document to enter or re-enter the U.S. since January 2007. It is true that the new law was scheduled to have gone into effect January 1, 2008, requiring travelers returning by land or sea to have a passport, but the date has now been postponed until summer. Another requirement that will take effect on January 31, 2008 is that travelers 19 and older re-entering the U.S. by land or sea will need to present proof of citizenship (a birth or naturalization certificate), as well as a photo ID. At any rate, turnaround time for passports is still longer than usual, so apply now for any travel planned for this spring or later. OAXACA CITY, MEXICO – Instituto Amigos del Sol and Planeta.com announce the 2008 Rural Tourism Fair will be held January 21-30. 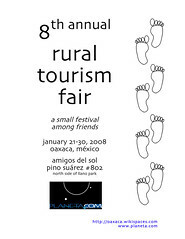 A small festival among friends, the 2008 Rural Tourism Fair will be the eighth annual tourism fair created by Planeta.com and friends. The schedule will be developed using the methodology of Open Space Technology and shared on the Oaxaca Wikispace. In town look for information at Amigos del Sol, Pino Suárez #802. There will be guided and self-guided tours focusing on artesania, biking, coffee, energy, food, markets and Oaxaca’s historic and notable trees. If you cannot join us in person, share photos of rural tourism where you live in the popular Rural Tourism Flickr group. The fair highlights rural travel and ecotourism and brings together inspired travelers, local travel providers, community leaders, indigenous artisans, media, academics and students. The annual event provides opportunities for dialogue among travelers and locals about ways to explore the rural countryside in a responsible manner. There is no cost to attend and no cost to share information. We ask local tour guides and artisans to complete a registration form and to provide at least 50 flyers or business cards to be distributed on January 26. In 2008 the fair changes from a one-day event at Amigos del Sol to a nine-day event held at various locations in and around Oaxaca City. Our motto: think smart, travel slow! There will also an international component featuring responsible travel and ecotourism in Australia and New Zealand. The outcome remains the same — good networking opportunities and information sharing, great food and updated content on Planeta.com. The complete agenda will be edited on the Oaxaca Wikispace. Also, in tandem with Planeta.com’s showcase of practical applications of Web 2.0 technologies, the fair has its own Facebook page. Flickrmeets and photo safaris will also be arranged. Visitors with web skills (Google Earth, Flickr, YouTube, Wiki) are encouraged to share their knowledge with locals at workshops that will be convened at cybercafes in Oaxaca City and Teotitlán del Valle during the event.